The Yamaha CS6X synth (and the CS6R sound module) was one of the powerful precursors of the MOTIF synth series. Announced in 1999, these synths sported features that remained unmatched for years. With 64 voices, an unsurpassed array of digital filters (different filter types for 6, 12, 18, 24 dB/oct - including combination filters), and a phrase sampling facility, these were truly impressive synths. The sound quality of these units was also highly superior to that of some big competitor's models. The only thing that definitely falls short of expectations is the single insert effect unit. To give some compensation, the chorus unit supports a wider range of effects, including delays and phasers. Altough the user controls support live performance well, it becomes very tedious as far as editing is concerned. 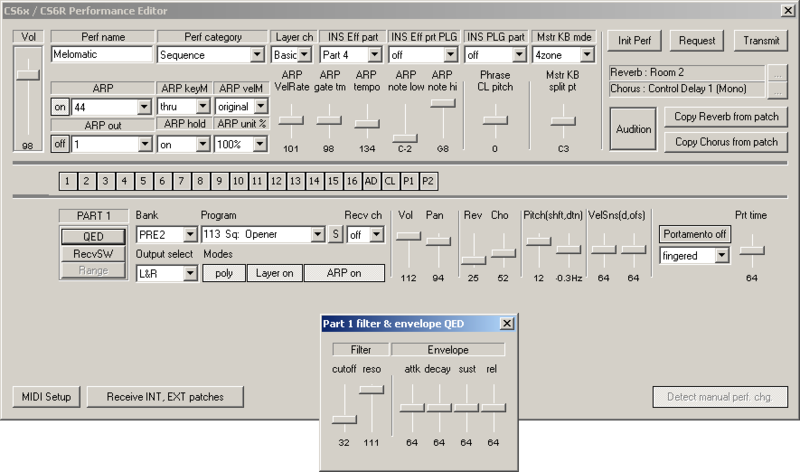 Yamaha has released a voice (patch) editor, but there is no performance editor available. You can use Emagic SoundDiver, but you may find it an overkill. It is unfortunate that these great synths' true power remains hidden or hard to access because of a difficult UI. That's why I decided to write my own performance editor software. Altough I didn't spend much time on the project, it has now reached maturity and is proved to be a useful tool. Spoiled by the UI sugar of other synths, I must admit I created my first performance on the CS6R with this software - once it was ready. Here's a screenshot from the current version. After downloading and extracting the ZIP file, the program can be executed right away. Did you find this software useful? If you are satisfied with this software, you can support the development by making a donation.